Have you noticed the ads that appear at the top and sides of every Google search you’ve ever done? Every single one of those ads is created with Google AdWords. And if you’re a small business owner with a Yola site out there working for you already, AdWords is a great way to grow your business and ramp up your site traffic. 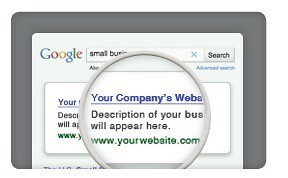 AdWords is Google’s way of helping you advertise on the web. It’s a powerful tool that gets your products and services in front of the people looking for them, right at the moment they’re searching. You create keywords and ads. Your ads show up next to relevant search results. People click on your ads. You only pay when they click, and you decide beforehand how much you’ll pay. There are tons of tips and tricks to delve into once you’ve got your AdWords account going. In this post we’ll stick with the basics to get you started. Creating your AdWords account is quick and easy. Start here. If you’ve been waiting for it to get even easier, good news: Google will now set up your account and your first campaign for you for free, over the phone. 2. Choose your keywords; create your ads. “Keywords” simply means words and phrases related to your business. For instance, if you’re a wedding planner, “wedding planner” will definitely be one of your keywords. You use your keywords to make ads that target all those customers out there, searching for you on Google (and a big network of partner sites, too). Since you decide how much you want to pay each time a potential customer clicks on your ad, you can keep it all within the budget you’ve decided on. 3. Your ads appear on Google. When your future customers search Google with your keywords (or even similar ones), they can see your ad alongside or above their search results. It’s called a “sponsored link”. You can even control where your ads appear. You’ve got control, and can choose to target your advertising to people who are already interested in what you’re offering. So they’re primed to click your ad – then browse your Yola site, learn more about you, and make a purchase. AdWords lets you track your traffic and budget with graphs and performance stats so you can see what’s working. It’s easy to edit your ads once you find out what’s successful and what’s not. If you want to get really advanced, you can include video in your ads and even make ads for mobile phones. AdWords also gives you much more effective ROI, super-precise results tracking, and wider reach (by far!) than traditional ads, so it’s an incredibly effective use of your marketing budget. And just so you know, if you’ve got a Yola Silver account and you’re a new AdWords user, you get a $50 credit towards your AdWords campaigns. What’s not to love? In future posts, we’ll get into the nitty-gritty details of how to make your AdWords account work as hard for your business as you do. We’ll demystify quality scores, first page bids, average position, keyword status, the Traffic Estimator, and the Google Wonderwheel. In the meantime – what are you waiting for? I agree pay-per-click is an effective method of promotion, try asking a publication or broadcast station to show your ad. without paying, saying you’ll just give them a small payment everytime someone responds. You can imagine the reaction!